Accidents tend to happen quite often, especially in congested areas like Long Island and New York City. Normally, if a driver is involved in a motor vehicle accident, a pedestrian accident, or an accident involving property damage, among others, usually they remain at the scene until their information is exchanged (name, phone number, insurance information, etc. ), the police report is completed, and all parties involved received medical attention, if necessary. However, there are unfortunate times when individuals involved in accidents flee the scene prior to any information being exchanged or reporting the incident. This is known as a hit and run accident. Hit and run accidents on Long Island and in New York City are becoming quite prevalent. Often, those who caused the accident are the ones who typically leave the scene immediately in these cases. Usually, they leave because they don’t have motor vehicle insurance, don’t have a license, are driving under the influence of alcohol and/or drugs, or they do not want to be involved in litigation. Leaving the scene of an accident is not only morally wrong, but it has harsh consequences as well. New York’s Vehicle and Traffic Law (VTL) Section 600 covers hit and runs. In short, the title of this section is “Leaving Scene of an Incident Without Reporting.” There are two sections of this statute: one for property damage and one for personal injury. The property damage portion of the statute describes that a punishment includes a fine of up to $250 and/or a jail sentence of up to 15 days. 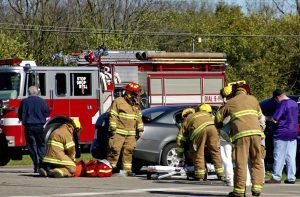 The section of the law covering leaving the scene of an incident without reporting for personal injury, the regulations are a little more in depth. For a first-time infringement of this statute for not exchanging the proper information, the punishment is considered a class B misdemeanor and is punishable by a fine anywhere between $250 and $500 and/or a possible jail sentence of up to 90 days. A second offense constitutes a fine between $500 and $1,000 and/or jail time of up to 1 year. If an individual is in violation of VTL 600 for a reason other than failing to exchange the proper information, then the punishment is very similar to a second offense for not exchanging information. Though, this infringement is considered a class A misdemeanor. The punishment for this crime is a fine between $500 and $1,000 and/or a jail sentence of up to 1 year, similar to the second offense for failing to exchange information. The greatest penalties for violation of this law are reserved for those who cause serious injuries or death of the victim if they do not remain at the scene. If the victim is seriously injured and the individual who injured the victim flees the scene, then that is considered a class E felony, which is punishable by a fine between $1,000 and $5,000 and/or other punishments, including incarceration of up to four years. If the victim dies, then it is considered a class D felony, which is punishable by a fine between $2,000 and $5,000 and punishable by up to seven years in state prison. Following a hit and run accident, a victim should attend to their immediate medical needs. Secondary to addressing his or her medical needs, a victim must report the hit and run accident promptly to the police, usually within 24 hours. A victim may also want to contact an experienced New York hit and run accident lawyer who can advise them of their legal rights and remedies. If you or a loved one are a victim of a hit and run accident, it is important to contact an experienced New York auto accident lawyer who can advise you of your legal rights and remedies. The attorneys at Levine & Slavit, PLLC have over 60 years of experience representing clients in personal injury actions, including motor vehicle accidents. With law offices conveniently located in Long Island and New York City, Levine & Slavit, PLLC represents clients throughout Nassau County and Suffolk County as well as Manhattan, Staten Island, the Bronx, Brooklyn, and Queens. For more information or to schedule a consultation, call (888)-LAW-8088.